I was born in Illinois. I live now in Arizona and Florida. I’ve been writing ever since I can remember. I wrote a children’s book when I was seventeen. I swim every day. I love to walk as well. When I’m not writing books I’m writing and playing music. I’m a professional psychic. Everything works together. I don’t know, but they can ask me and I’ll probably answer. I had an Old English sheepdog that my little brother was fascinated with. I wrote him a little book about the dog’s adventures. 8. How do you decide on that topic or genre? My work is all self-help. It chose me. 9. How do you manage to keep yourself focused and on track? Being a clairvoyant counselor, I focus for a living. If I couldn’t focus I wouldn’t have any clients. It’s simply a matter of quieting the chatter of the conscious mind. It’s a mindful focus. I’ve had a lot of practice. 10. Do you write to make money or for the love of writing? Of course I have to teach you something while answering this question. We do not “make” money. Money is energy. We create an open pathway for the energy of money to flow to us. I write because I have something to teach and I love to do it. When the creative pathway is open the money follows. It’s energy. 11. What are some traditional methods of marketing you have used? The key to marketing is distribution. You can have the best book in the world and if nobody can find it you won’t be selling very many copies of it. Amazon is great, Baker and Taylor/Barnes & Noble are all very important. Author signings are wonderful ways to connect with people. Radio interviews should be at the top of anyone’s list as well. 12. What are some unique methods of marketing you have used? The Virtual Book Tour is the most unique thing I’ve done in terms of marketing. It’s great fun. People can order my books through Amazon.com, any traditional bookstore, or through my website. Right now they are just in print, however, I’m working on getting them into e-books. No, Money and Manifesting is the last one for now. It’s at the top of the toolbox of tools for spiritual growth and transformation that I’m almost finished building. I have two more items that go in the toolbox. One is a DVD animation. The other is another music CD that will vibrate to the eighth chakra. The existing CDs are a series of music and meditation CDs that each vibrate to chakras one through seven. Looking into my crystal ball, I see…..oh, that would be absolutely no fun to peer in on my future. I’ll just let it unfold. I’m doing it. The Virtual Book Tour is just great for book promotion. I’m also very fond of author signings because I like to connect with people directly. Well, again, it all depends upon how you define “successful”. To me there is no success and no failure. Those are simply perceptions and usually they are someone else’s perceptions. In my definition of success everything is simply an opportunity. This interview was done in conjunction with Nikki Leigh, author of the Book Promo 101 series. For more information, visit – www.nikkileigh.com/promo.htm. How did you get interested in the topic that’s featured in your book? 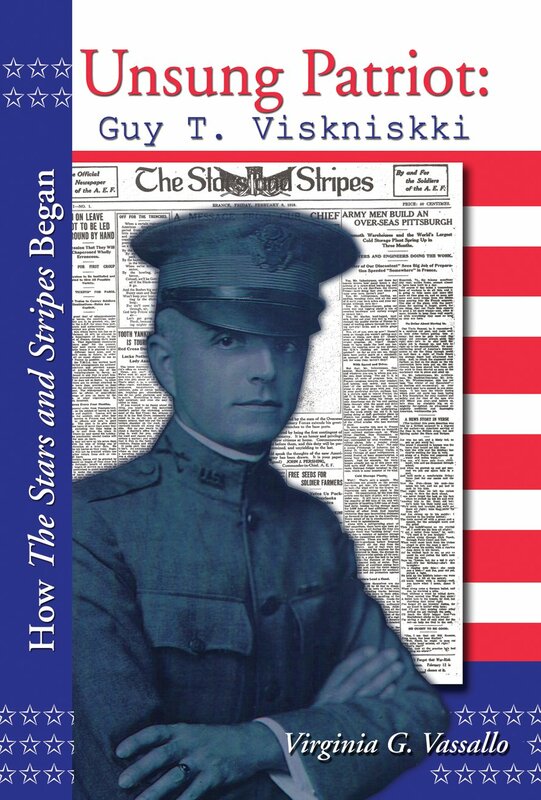 My book, Unsung Patriot, is about my grandfather, Guy T. Viskniskki, and how he started The Stars and Stripes newspaper during World War I. The easy answer to how I got interested in the topic is that I can’t remember a time in my life when I didn’t know that my grandfather started the paper. Admittedly, for many years, I had no idea what the paper was. In fact, I remember asking my mom, “If Guydaddy started the paper, why don’t we get it?” This was in the 1950s; there was no Internet and only the armed forces received The Stars and Stripes. After my mom died and I found that I had inherited my grandfather’s 437 page manuscript about his experiences trying to start the paper, I thought I should write up something for my grandchildren. It grew – because I had to know more and more. And finally it became a book. Tell us a bit about your background. What have you done in the past that relates to your book and your topic? Obviously, being the granddaughter of the man who started The Stars and Stripes and having information only the family had uniquely qualified me to write this book. On another level, I was a history major in college and then became an attorney so much of the writing that I had done has been on either historical topics or non-fiction, such as legal briefs. Since my topic is historical non-fiction combined with family information, I think I am a ‘natural’ to write Unsung Patriot. What advise would you give to someone who is interested in your topic? First of all, that person should read my book. Second, The Stars and Stripes Museum/Library in Bloomfield, Missouri, has exhibits covering the whole history of the newspaper and they also have a research library. Third, you can join the European-Pacific Stars and Stripes Association. Initially the group was composed of men and women who had worked for the paper during their time in the armed forces. However, they have recently expanded their membership to include people who are interested in The Stars and Stripes. The yearly dues are nominal and you get 4-6 issues of their newsletter a year plus they meet once a year in various locations. I am waiting for 2009 when they are meeting in Reno, NV, to go again. Other than those suggestions there is no a tremendous amount of information out there about the newspaper during the First World War. What do you see as the benefit of participating in groups and organizations? My first thought would be networking opportunities and the chance for personal and business growth. What are your reasons? Certainly those are good reasons, Nikki, and they are some of the reasons I belong to various groups and organizations. Obviously belonging to the S&S Association is a plus for information about the paper today. I also belong to several genealogical groups because I have a real interest in tracing my family’s origins and those of my husband. Some of those contacts have resulted in sales of my book – probably because of the similarity of interests among the participants. And, besides, some of them have monthly meetings nearby and it’s fun to get together. Who is the ideal person to read your book? If each person that reads this was going to recommend your book to one person, what sort of person would they want to choose? Unsung Patriot would appeal to a person who is interested in history, a person who is interested in genealogy, a person interested in military history, a person interested in journalism and newspapers. What do you think ignites a person’s creativity? First and foremost, I think a good imagination is necessary. Even when writing non-fiction, you have to be able to imagine or see how the book will flow together. This is especially true when you are gathering information from a variety of sources. Believe it or not, for me walking in the woods and fields of our farm helps my creativity immensely. My mind is free-floating, looking at the world around me, wondering what my dogs are scenting, yet it seems I come back from a long walk refreshed and with new ideas. Yet I am not conscious of thinking about anything in particular. What have you found to be the biggest stumbling block for people who want to start writing? I think potential authors look to the end result – will someone publish this book? How do I get it published? Do I really want to have to do my own marketing? It can be daunting and scary. When I started writing Unsung Patriot, I started writing for my children and grandchildren so that they would know about my grandfather. I never thought I would actually write a book that would be sold at book fairs, in stores and on the Internet. That came much later. I believe I probably wouldn’t have started writing if I had realized what I was really going to do with the end product. I had to work in to the idea of being a published author. How would you suggest they can overcome that? Write for your own enjoyment. Write for one other person – a spouse, a child, a grandchild. Don’t think that what you write must be published. Think about just telling your story. One of my neighbors is 80 something and tells wonderful stories about growing up in rural Kentucky. She has finally written down some of her memories and we are all elated. It brings this small part of the world to life – what it was really like to live here back in the Depression. And it’s a very different that the story you hear of how the Depression affected city dwellers. What do you find is the biggest motivator for people to succeed? Is it money, security, desire for fame or something else? I think it varies from person to person. Some people want they approval of their readers. Others want to make lots of money from their books. Still others want to prove to themselves that they can do it. For me, I think it’s a combination. I wanted my family to know about my grandfather. Now that the book is out there, I would like to make at least enough money to pay for the cost of getting it published. And I am on my way to accomplishing that! Who is the “perfect” person to read your book? The “perfect” person would be anyone with an interest in, or a love, of history. Nikki, I think you have been very comprehensive. I would just like to invite your readers to visit my websites – www.krazyduck.com and www.unsungpatriot.com. This week, I’m starting to coordinate a special virtual blog tour for Dyan Garris. Some of you participated during the tour we are doing this month to promote her latest book Money and Manifesting. We appreciate every one that has participated with us. For this tour, we are looking for blog owners who deal with the topics listed below. If you would like to focus on these topics on your blog, please contact me. To participate, I simply need each blog owner to review her website and to send me for 5-10 questions about the products or services that she offers. I also have a document that has all the items, the prices and descriptions listed. I can forward that to anyone who needs the list. These are the topics that we want to focus on during her tour in May. This tour will be May 12th through the 16th. We can also schedule blog visits for a couple of days before or after those dates if needed. Dyan Garris is also available for radio interviews – contact me for more details. In return for your participation, your blog will be promoted through the tour schedules and the promotional messages that I post to promote each blog visit on the tour. This can be a good way to generate new visitors for your site. It also creates a good number of links back to your site. If you discuss any of the topics listed above on your blog, feel free to contact me to schedule a date for Dyan Garris to be a guest on your blog. Each person who posts a comment on any or all of the blog tour spots will be entered in a random drawing for a copy of Dyan Garris’ CD – Release. In addition – the blog owner that hosted the winning commenter will also win a free copy of Release. Share your thoughts and comments with Dyan. She will check in throughout the day to answer questions. You’ll learn more and you have a chance to win a CD. For more information about Dyan Garris and her virtual tour, you can check the full schedule at http://virtualblogtour.blogspot.com/2008/04/dyan-garris-may-schedule.html and here are more details http://virtualblogtour.blogspot.com/2008/04/dyan-garris-may-blog-tour.html. Her website is full of great details about all of the items within her “toolbox” and there are many special features. She provides the tools you need to have a full and happy life – www.voiceoftheangels.com and it’s not as hard to achieve as you think. Visit Dyan’s Amazon profile for links to many of her products – http://www.amazon.com/gp/pdp/profile/AYREZNHQDLRFM/. You have been invited to share you experience with our readers. Originally, I’m from England, but I left there when I was a child. Now I make my home in the Southwest U.S. I can’t really remember a time I wasn’t writing something. I suppose the bug bit me when my grade school had a poetry writing project, and then I just never stopped writing—whether it was poetry, short stories, journalistic pieces, and later full-length fiction and non-fiction. When I’m not writing, I’m reading and editing or doing some type of graphic design or ad layout work. I sleep sometimes, too! The very first book I wrote was a romance. I had picked up a harlequin, read it, and thought, “This is simple; I can do this.” Hah! 50,000 words later, and a wake-up call as to how awful that book really was, I realized that to pen a novel is easy; to pen a novel that is actually good, is not so easy. That book was terrible…and so was the next…and the next. I don’t think I actually got the hang of how to effectively tell a tale until the third book. I’ve finished five novels or novellas, and have others in various stages of outline or partial. Three of those five will probably never see publication. They were stepping stones to good writing. How do you decide on their topic? With fiction, my plots are usually a fancy that just comes to mind. I swirl them around until the basic premises are there, and then I begin writing. My characters do the rest. With non-fiction, if the work isn’t commissioned, the idea usually comes from a life observation or experience. Do you write to make money or for the love of writing? Both! I want my love of writing to make me some money. Seriously, I write first for the love of writing. It is a gift to be able to tell a tale that will whisk someone away to an alternate reality for a time. Of course, I’m not opposed to making money, and so I do what I can to promote, and hope lots of people buy and enjoy my books. My Christian works, on the other hand, I write solely for the glory of God (Well, everything I write is for His glory, but these in a more direct way). If I make money, that’s great, but if I don’t make money, yet some reader comes to know Christ more fully because of reading something I wrote, then that’s a greater reward than money. What are some traditional methods of marketing you have used to gain visibility for you and your book(s)? Gathering book reviews and placing magazine ads have to be the top of the traditional marketing methods I’ve used. Also, website advertising on high-traffic sites. What are some unique methods? I don’t know if one would call this unique, but I’ve recently started utilizing book trailers. There’s a terrific site which is currently housing trailers for one year at no charge to the author. http://www.previewthebook.com The trailers there are top-notch quality. I’m also looking into pod-casting, but instead of the pod casts coming from me, they will come from my characters. Do you sell through a website? Much of my work can be bought through my own website, http://www.inicola.net, and what’s not available from me directly is available online through the publisher’s site http://www.thewildrosepress.com or from Amazon, Fictionwise, and other online outlets. Do you plan on writing additional books? Always! I don’t think I will ever stop writing. I enjoy it too much. I’ve always loved reading historical romance and was inspired to try my hand at writing one of my own. In 2002 I sat down at my computer and started typing. I felt as if I was telling myself a story and couldn’t wait to see what happened next. That’s when I discovered that I write by the seat of my pants. My characters drag me wherever they want to go and I never know the outcome until I’ve written it. As I said, I was inspired by my love of reading. I ran out of books that had ‘savage’ in the title and decided to write one of my own. I currently have six books and five novellas published with two more contracted and soon to be released. I don’t really decide. Storylines come to me from no where in particular and I name my characters and let them run with the idea. What works best to keep you focused and on track? Finding quiet time when I can sit without interruption and get in touch with my characters. I try to have coffee with them occasionally to ask the questions to which I need answers. I’d love to make money writing, but since my royalty checks barely cover the cost of a McDonald’s happy meal, I do it for the love. It’s actually a stress release for me. I can let my characters act in ways that I don’t dare. Many of the same that all authors are advised to utilize: personal website, participation in writing, publishing and review loops, handing out promotional materials such as personalized key chains, bookmarks, pens. For my first release I prepared a trifold containing an excerpt. The front displayed the cover, ISBN and ordering information, and I left these wherever I went. I also included them in things I mailed. I created a book bag with pictures of all my book covers and an invitation to “ask me about my books.” I carried it when I went to car shows and public places. Anything that stirs interest is helpful. I also started a newsletter group that has now grown to over 500. Every month I share information, personal and professional with my fan base. One of my favorites was ordering business-card-sized CDs and downloading excerpts from several books and offering them as a reward for those who enticed others to join my newsletter. I can only do that with one book since I exclusively hold the print rights to it. My other contracts stipulate that I can only sell through the publisher’s site or my own. Of course. Writing is my life and I’m not happy unless I have at least two works-in-progress. Now writing has become a challenge. Every new work is my hope for achieving a little more notoriety than I did with the previous one. This interview was done in conjunction with Nikki Leigh, Author of Book Promo 101 – www.nikkileigh.com/promo.htm. The Street Smarts Marketing Blog is for speakers, trainers, authors, consultants and entrepreneurs who want to influence the lives of others with your knowledge through books, information products and presentations – and make lots of money doing it. Strong emphasis on gaining visibility, market reach and credibility through effective Internet marketing. I wanted to be a writer. The old saying, naïve as it is, says to write about that which you know. I had been on more than 3,000 client lunches and saw my sales increase by more than 2,000%. I knew I was on to something. I wanted to share the how-to’s of building relationships by introducing a social aspect into your business relationships with other sales people or business professionals who count on their relationships for their success. I have since learned that you can write about anything if you are willing to do the research. Still, it’s best to write about something you’ve experienced. There is nothing like having had hands-on experience to be able to tell a better story. “The Art of the Business Lunch ~ Building Relationships Between 12 and 2” was my first book. I originally self-published; that edition came out in February of 2004. Then I sold it in 2005, doubled the word count and it was released by Career Press a full two years later, in February of 2006. Now, promoting that book as well as promoting my speaking career, writing articles, blogs, and press releases keeps me incredibly busy – plus I launched a speakers bureau last year. I have begun work on two new books – both non-fiction. I have contributed to two anthologies in “The POWER of Mentorship” series, including “The Millionaire Within” and “For the Woma n Entrepreneur,” for which I was asked to write the foreword. Don and Melinda Boyer are the publishers of the series and they are remarkable, positive people. They also invited me to be a featured teacher in “The POWER of Mentorship: The MOVIE” which is currently in production. It’s a personal development film that features about 20 teachers whose lessons are interwoven with the story of a young men and his mentor. And I just found out that a chapter I submitted to “Chicken Soup for the Wine Lover’s Soul” has been accepted. That book will be out in November. I wrote about how to order wine when out with clients. Many times, people who are unfamiliar with fine wines become intimidated and hand the wine list over to their clients. That means they’ve given up control of the cost of the meal. It’s not necessary. I share a way to involve your clients and yet retain control of the check. I’m very excited to finally be a part of the Chicken Soup franchise. As I mentioned earlier, I was an expert at building solid, long-lasting business relationships. In fact, my clients and friends started calling me “The Queen of the Business Lunch,” because the nature of my job, selling advertising, required that I stay in close touch with my clients…so I was typically booked for lunches weeks out. Closing OUTLOOK! That and not answering the phone. Seriously, it gets easier when you have a task to complete. I have a paperweight that reads, “The Ultimate Inspiration is the Deadline.” It’s really true. Most everyone I know who writes really works well under pressure. The rest of the time, we just need to focus on the desired outcome. I feel a strong sense of purpose and I love to write. When I can stop working long enough to write something, the time just flies. Do you write to ma ke money or for the love of writing? You ought to be able to ma ke a living doing what you love. While I originally dreamed of hitting it big financially with writing, (and still do! ), I found that being an author was a great springboard for launching a speaking career. In fact, all speakers should have books. Most of them begin speaking first and then create a book or other product to sell in the back of the room. Personally, I wrote the book, expecting that it would be a huge success. It is, but it’s not necessarily a financial success. My book has won an award and my publisher has sold the foreign publishing rights in TEN languages so far! And there is still more interest in it. I’d say that is a huge success. My topic is a tremendous hit for training and sales conferences. I think the principles, techniques and knowledge in my book is quite timeless. I can’t see a time when it wouldn’t be applicable to business, although I can see needing to update it occasionally. I bought ads in the beginning. Of course I was an advertising account executive in my past life, so I believe in advertising. It wasn’t the best use of my resources! Speaking generates book sales, as do appearances. I have sold several hundred books at a time to incoming conventions; I am the draw for their booth, signing books for the exhibitors and attendees. That’s one of my favorite things to do, because I know that my books will get on the plane with their new owners and travel all over the country, spreading the word. Internet marketing is the most important way to get the message out now. Blogs, articles and press releases are strong. Also, it’s important for authors to network. When I speak on networking, I ask the room, “Who do you know who…. ?” We can expand our circle of influence by getting to know more people. It’s critically important that we know as ma ny people as possible. Writing columns may not be the most unique, but every time you can put your name in print it will help. My dog, an adorable shihtzu, writes a column in Lucky Dog magazine. Of course she can talk about “Her mommy” and that would be me! I get a byline in a magazine with a circulation of more than 15,000 readers. I also write a column for “Around Your Home” magazine, which goes out to 80,000 high-end home owners every two months. I have a photo and a bio at the bottom of those articles. I don’t get paid to write them, but when I’m out, I have a lot of people ask, “Where do I know you from?” Or they comment on the columns. Everyone knows Georgie, my dog, and asks about her. I also wrote a lot of columns for Hospitality Executive magazine, which goes out to meeting planners and hotel execs everywhere. And I was recently hired (yes, a REAL job!) by the Las Vegas Business Press to write a bi-weekly column on women’s and minority issues. All of this exposure lends credibility and helps me to promote myself and my books. Absolutely! My website offers my books, audio books, and my services as a speaker. I don’t know how anyone could get away without having a website anymore. It’s immediate, it’s current and it’s effective. I hope I will always write. I have a lot to say about a lot of things. I love teaching, helping and guiding. I also consult as a life coach and I help other authors – whether they want help with their writing or if they are launching a speaking career. I teach PowerPoint and presentation skills. And, because I have self-published and worked with a publisher, I am uniquely qualified to help authors decide whether they should self-publish or sell. I have personally experienced the ups and downs of both sides of that equation. I especially enjoy helping authors so they won’t have to make the same mistakes I have made. My experience has been invaluable. I am a professional speaker and consultant as well as a writer. I absolutely love writing and speaking; I know without a doubt that this is what I was meant to do. I am also a gourmet cook. I love to play golf and work in my garden…but both of those hobbies have had to take a back seat to my career the past few years. I still indulge my desire to cook, usually by hosting dinner parties with great friends or just cooking when company stops by. I’m originally from Cleveland , Ohio and have lived in Las Vegas for more than 33 years. I have always enjoyed writing and had contributed stories to magazines in the past, although I didn’t set my sights on writing as a career until early in 2001. Hi! I’m Kim Baccellia, the YA author of the multicultural fantasy, Earrings of Ixtumea. I’ve been writing ever since I can remember. I always seemed to have a story running through my head. In middle school I wrote a horoscope column that was very popular with both my peers and teachers! In both high school and college I wrote for the school newspaper. Later as an educator, I ran my own writers workshop for my first grade classroom. My students published their own books. My husband even made a computer program where parents followed their child reading their books. I videotaped my students reading and my husband scanned their books. This was a big hit with parents. Even as a teacher, I would find extra moments to write. During my lunch breaks I would sneak over to the local Burger King. I wrote some of Earrings there. Not finding enough multicultural heroes in fantasy novels. I was a bilingual teacher for a school district in LA County and found it odd that there weren’t many books, especially YA, that represented the population I taught. is my first novel. I’ve also written a YA paranormal, Crossed Out. Right now I’m working on Bullets of Truth, a contemporary YA that deals with bipolar disorder. The idea came to me to develop a world with Mexican mythology while I was teaching second language learners. I wanted to create a world that had some of the richness of my Mexican culture. Also I love Spanish dichos—similar to our own proverbs. I wove these throughout my story. Getting up early each morning and just writing. It helps to have my own writing space. I have a large whiteboard where I sketch out my story paradigm. I divide my story into three acts. I also have character sketches in my room. I write because I can’t silence the stories that run through my mind. I also love to write. I’ve purchased advertising spots with sites that are geared toward my market—teen girls. My book is available through Amazon. I have a live journal blog. I belong to two professional organizations—SCBWI and EPIC. My current virtual book tour. I thought why should I wait to have my book published through a traditional publisher in order to have a book tour? Having my book on a virtual tour opens up a lot of possibilities that are limited by just the book store signings. Yes. I plan on writing a sequel to Earrings. Right now I have a rough outline for books two and three.